Scientists have discovered ways to study the earth's climate, going back as far as thousands, or even millions, of years. Those who specialize in studying ancient climates are known as paleoclimatologists, a name derived from the Greek root word paleo , which means ancient. Paleoclimatologists use natural elements in the environment to find "proxy climate data" related to the past. When they study these types of data, these scientists typically use several different methods, so they are assured of forming the most accurate analysis possible. One way that paleoclimatologists unlock the secrets of ancient climates is by studying the rings in certain types of trees, such as the redwoods and giant sequoias found in California and different varieties of pines. As a tree grows, it adds a new layer of wood to its trunk every year. 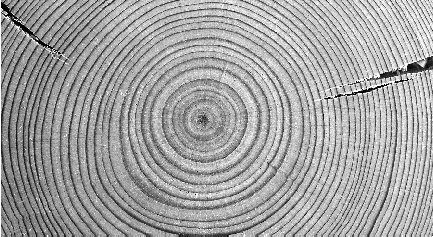 This forms a ring, and the age of the tree can be determined by counting the number of these annual growth rings. Many trees live to be hundreds of years old, and some live for thousands of years. The oldest trees on Earth are the bristlecone pines, many of which are found in the Ancient Bristlecone Pine Forest in California's White Mountains. The average age of these trees is 1,000 years, and a few are more than 4,000 years old. In 1964, before there were environmental laws to protect ancient trees, a particular bristlecone pine named Prometheus was cut down. After analyzing the tree's rings, scientists determined that the tree had been 4,862 years old—the oldest living thing on Earth. Paleoclimatologists can learn more than just the age of a tree by studying its rings. They can determine what sort of climate conditions existed during its life by analyzing the thickness of each tree ring. Thick rings are a sign of favorable climate, abundant rainfall, and good growing conditions. Thin rings indicate poor growing conditions and lack of rain, as well as natural disasters such as droughts, floods, and volcanoes. Samples from trees can be obtained in several different ways. Scientists do not want to needlessly destroy living trees, so they cut cross sections only from dead trees, logs, or stumps. These can be found intact on the ground, buried deep in the ground, or submerged in water. Tree remnants that have been buried for hundreds or even thousands of years have been found and analyzed. For samples from living trees, scientists use a tool known as an increment borer to drill a thin hole into the trunk. Then, a core sample of wood about the size of a drinking straw is extracted for analysis. This boring does not cause damage to the tree because when the sample has been removed, the tree naturally closes the small opening just as it would close a wound caused by insects or weather. Tree rings like these not only tell scientists the age of the tree, but they also provide a record of climate change over the centuries. Once the wood samples are obtained, scientists return to the laboratory to measure and date them. Cross sections of dead trees are often old and brittle; and scientists may need to glue pieces together—or mount them on a hard wooden surface—for added protection. Cores that are taken from living trees are soft, so they must be dried before being mounted for examination. The next step is to sand the samples or trim them with razor blades to produce a smooth surface that makes the fine details of the rings more visible. Then scientists can examine the samples under a microscope and record their findings about the tree's history. Another way paleoclimatologists analyze historical climates is by studying samples of varves—layers of silt and clay that are deposited year after year on the bottoms of glacial lakes and ponds. Varves provide natural climate records going back several thousand years. They consist of two layers: a thick, light-colored layer of silt and fine sand that forms in the spring and summer, and a thinner, dark-colored layer of clay that forms in the fall and winter and sinks to the bottom. Varve thickness varies from year to year, usually according to the climate and the amount of rain that falls during a particular season. For example, when temperatures are especially hot and dry and there is little rain, less soil is washed into the water, and the varve layers are thinner. On the other hand, when spring and summer rains are heavy, a greater amount of soil is washed into lakes and ponds, and this causes thicker varves. Paleoclimatologists collect varve samples by using long, hollow tubes to drill into the soft bottoms of lakes and ponds. Once they extract this material, they analyze the different layers that have been deposited over time. To gather data from oceans, scientists spend two to three months on research cruises. Using highly specialized equipment, they remove samples of deep-sea cores from beneath the surface of the ocean floor. These long cylinders of sediment provide valuable evidence about changes in ocean temperatures that were caused by fluctuations in climate. Marine fossils such as these provide clues about climatic conditions during the fossilized creatures' lifetime. tell what plants grew during certain periods in the earth's history. Also, they can make accurate estimates about changes in climate. This is because for every type of pollen, certain habitat conditions would have been necessary for that particular kind of plant to survive and thrive. Coral reefs have grown to gigantic proportions over the centuries. 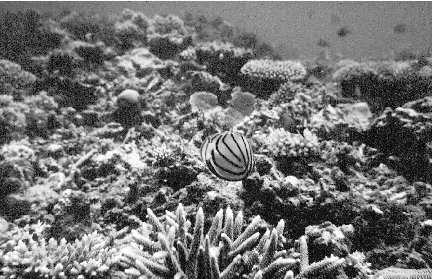 Scientists study a reef's layers to learn about long-term climate changes. cities because they are the largest biologically built structures on Earth. Every time a piece of coral skeleton is created, it leaves a record of the conditions under which it was created. For instance, when water temperatures change, the chemistry (or makeup) of the skeletons also changes. 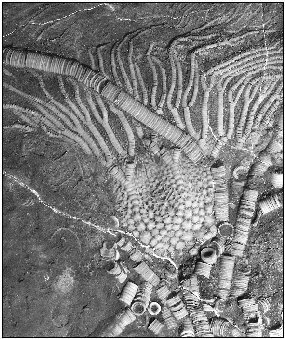 The result is that coral formed in the summer looks different than coral formed in the winter, so it is easy for paleoclimatologists to know in which season the coral was formed. As coral reefs grow, growth bands form that are very much like the growth rings found in trees. Sometimes these bands are visible to the naked eye, and sometimes scientists can only see the bands by x-raying them. Once scientists have carefully extracted the cores, they label and box them for shipment to their laboratories. There they x-ray the coral to examine the growth bands, which helps them determine the seasons in which the corals grew. With this proxy climate data, paleoclimatologists can analyze how climates fluctuated in the reef over hundreds of years. Just as scientists gain clues about climate from warm, tropical seas, they can also gather knowledge from the coldest places on the earth. In fact, some of the most revealing indicators of historical climates come from studies of glaciers and ice sheets in the world's polar regions. To gather samples of ancient ice, scientists travel to remote areas of Antarctica, where temperatures can dip as low as -129 degrees Fahrenheit. Massive ice domes, ice sheets, and glaciers are found in the Arctic and in Antarctica. These ice formations developed over hundreds of thousands of years as layers of snow pressed together. More precipitation continued to pile on top of the snow, squeezing the layers and slowly forming ice. As the layers accumulated, air bubbles were trapped inside, forming distinct lines that can be counted as easily as tree rings. Scientists examine the layers to determine the age of the ice and the approximate climate during a given period. 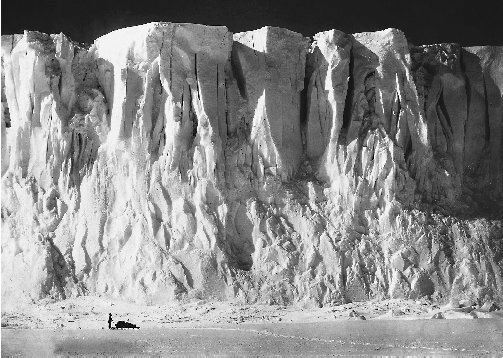 They can also tell how much snow fell during a year, as well as what kind of air, dust, volcanic material, and other microscopic particles—including pollution—existed at the time the ice sheets were formed. About 98 percent of the world's ancient ice is located in the polar regions, and most scientists choose to focus on those areas when they study ice. Others, however, believe that ice from tropical areas is even more crucial in order to understand how climates have changed over time. Lonnie Thompson is a glaciologist who studies ancient ice in areas such as South America and Africa. These regions have hot, tropical climates, but they also have very high mountain ranges where ice sheets and glaciers can be found. Thompson sometimes climbs mountains three or four miles high. On one expedition, he and his team worked for three weeks at an altitude above twenty-three thousand feet. This mammoth Antarctic glacier dwarfs the scientist at its base. Glacial ice cores give scientists a historical record of climate changes. equipment to the top of a mountain. There they must endure bone-chilling cold, the threat of avalanches, and such high altitudes that it is hard to breathe. There is also the risk of frequent windstorms. One particularly fierce storm knocked Thompson's tent from its moorings and nearly blew him off a mountain. During a typical expedition, Thompson and his team accumulate about four tons of ice samples, which means they must drag ten tons of equipment back down the mountain. He says it is well worth the effort, though, and he explains why he thinks ice is the best possible archive of the history of the earth's climate: "Understanding how the climate system works and has worked in the natural system is absolutely essential for any prediction of what's going to happen to the climate in the future." 10 Thompson adds that by examining ancient ice, scientists can determine climate conditions and changes over thousands of years in the past. Whether they explore ice domes in Antarctica, glaciers in Tibet, or ice sheets at the top of Africa's Kilimanjaro, scientists gather samples by using powerful drills to bore into the ice. The deeper the drill goes—and that can be several miles—the further it travels back in time. (Thompson's oldest ice sample is more than seven hundred thousand years old.) After drilling, scientists extract cores of ice and carefully package them in insulated containers, so the samples can be sent to their laboratories for analysis. Thompson says that by collecting ice samples, scientists can compile a frozen history of the earth. The reason scientists use proxy climate data obtained from ice, trees, coral reefs, and other products of nature is because they want to understand what the earth's climate was like long ago. Scientists use these types of data along with modern devices so they can learn more about how climate has changed over time, as well as how historical and current climates compare with each other. A highly sophisticated way of monitoring the earth's climate is through the use of satellites. Since the 1950s, NASA satellites have been observing Earth's atmosphere, oceans, land, snow, and ice from high in space. The data they provide can help scientists develop a better understanding of how these different elements interact with each other to influence climate and weather. One example is Terra , a satellite that was launched by NASA in 1999. Terra , named after the Latin word for land, is about the size of a small school bus, and its mission is to circle Earth for about six years. The satellite is fitted with a variety of sensitive instruments that are designed for specific purposes, such as measuring the chemical composition of clouds and gauging the temperature of the land. Terra 's MICR instrument has nine separate digital cameras that take pictures of Earth from different angles, while its MOPITT instrument uses light sensors to measure concentrations of methane gas and carbon monoxide, two heat-trapping gases. The satellite's instrument MODIS measures cloud cover and also monitors changes in Earth due to fires, earthquakes, droughts, or flooding. An instrument called CERES measures both incoming energy from the sun and reflected energy from Earth and studies the role that clouds play in this energy balance. 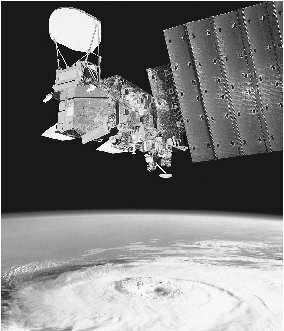 The Aqua satellite gathers data about a hurricane visible on Earth's surface. Aqua 's data helps scientists understand global climatic changes. global climate change influences this balance. Scientists are the first to say that there are many unknown factors involved in the study of global climate change. Products of nature such as ice cores, coral reefs, ocean and lake sediments, and trees can offer valuable clues about changing climates in the ancient past. Modern instruments like satellites can provide knowledge about current activities affecting the earth's land, oceans, and atmosphere. Assembling the pieces of this global environmental puzzle is the focus of scientists and researchers all over the world. They know for sure that the earth is warming—and using the many tools available to them, it is their mission to find out why. this was very helpful with school work and just plain interesting. Why don't they use only one method?Perfectly laid out desciption.Brief and clear. This article is very helpful to my work. It helps me with my school. I learned alot more about space. I love learning about space. When i grow up i want to be a astronaunt. When i was little i always wanted to be a scientits and a science teacher. not bad ! but a little bit hard to understand ! why don't you change to ur own word ? it not really easy for children to read or understand ! then just change to simple language ok? hoping so ! :) ! How can I cite this information? I can't seem to find any author or publishing information for my paper?